After breakfast we leave Marrakech to Ouarzazate (the Hollywood of morocco) through the magnificent Atlas Mountains and the pass of Tichka. 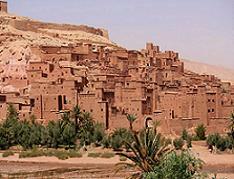 The lunch will be at Kasbah Ait Ben Haddou that is the most spectacular fortress in the South of Morocco. After lunch you will have the opportunity to explore this Berber village. Then continue to Ouarzazate to dinner and spend night. After breakfast living Ouarzazate to Todra Gorges through the road of thousand Kasbahs, passing by the date palms of Skoura. We continue eastwards via Kelaa M’Gouna where thousand of small pink roses are planted. Then we travel trough the Dades Valley and oued Todra of its beautiful landscapes, date plam oasis, and some old traditional Kasbahs. After that we arrive to Todra gorges where you will have lunch. After lunch, you can enjoy a nice and a guided walk in the oasis of Todra Gorges. Dinner and overnight at a hotel. After breakfast departure to the famous sand dunes of Erg Chebi, passing by Tinjdad and Erfoud, the later is a tourist destination par excellence to go to the desert. We will stop for some sightseeing in Erfoud, like fossils and Kasbahs. After lunch in a nice Kasbah, we will head for the sand Dunes for a wonderful peaceful evening. There will be a possibility of a camel ride tour in the sand dunes before the sunset. 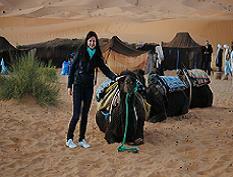 Dinner and overnight stay will be in a nomadic hotel in Merzouga. After breakfast, you will enjoy the great views of Jebel Aachi Mountain with peaks. Leaving Midelt toward Ifran where you will have your lunch and exploring this city, snow-coveredMoroccan Switzerlandyou will see the stone lion and take picture with it. You may have a visit to Al-khawayn (Two Brothers) University .Continuing on our drive to Fes passing by Imouzar Kandar. 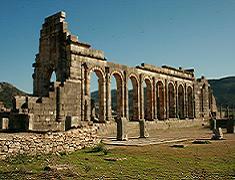 Then arrive to Fes where you will enjoy your evening meal and spend the night in a hotel/Riad. Today after breakfast, you will have a sightseeing tour to explore the Royal city of Fes. Your morning will be spent visiting the medieval Medina (old city) with its ramparts and narrow streets that was declared as UNESCO World Heritage Site in 1981. You will see the Merinid Tombs Ruins. You will visit the Bouanania and the Attarine Medersas, the Karaouine Mosque (The ancient educational centre of Islamic learning), and the Nejjarine Marble Fountain. You will have a break for lunch at a typical Moroccan restaurant. After lunch you will continue your visit to view the decorated gate of Bab Boujeloud, the medieval tanneries, and the Royal Palace .Then you will have a visit of the Souks (local markets) where merchants and craftsmen sell their hand-made jewellery, leather goods, copperware and pottery. Dinner and overnight will be at your hotel/ Riad in Fes. 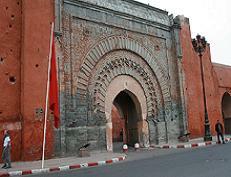 After breakfast, you will have a short panoramic city tour, including the Hedine Square and the great Mansour Gate. Then travel to Rabat, where you’ll enjoy an afternoon city tour of this diplomatic and administrative capital, after lunch you will visit the important sites like the Royal Palace, Mohamed V Mausoleum and the Hassan Tower. Dinner and overnight in a hotel in Rabat. After breakfast, we’ll get ready for departure from Rabat, the administrative capital of the Kingdom of Morocco, to Oualidia, which is a fantastic little seaside village with both a protected lagoon and surf beach. Oualidia is a beautiful seaside resort and it is famous for its seafood restaurants. At arrival, you will enjoy a fresh seafood lunch in a local restaurant. 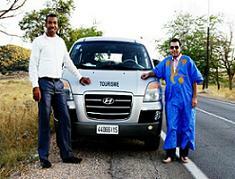 Then you will have a free time to explore the Kasbah and the beaches of oualidia. Dinner and overnight at a hotel. 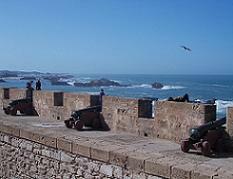 This morning after breakfast you visit the city of Essaouira, which is protected by the trade winds and surrounded by flowers, Essaouira "la Blanche" is the centre of the cabinet makers craft. Master craftsmen produce delicate pieces in lemon, cedar and sandalwood, preserving the character and aroma of these fine woods. Today you will explore Our visit includes the Sqala, the harbour, the door Marina & Medina. You may also visit an Argan factory run by women and get to know about the process of making Argan oil. Enjoyseafood is at your leisure;the port of the Coastal tourist town of Essaouira. a fresh lunch in the medina. The afternoon you can swim and relax on the beach. Dinner and overnight in a hotel. After breakfast, city tour, the Medina, the Jewish quarter, the Sqala, the stalls of cedar wood and the port. Take the fish along the coast in Essaouira for lunch. Then in the afternoon we depart for Marrakech, also known as the "Red City", the most important former imperial city in Morocco's history. Arrival in Marrakech for dinner and overnight at your hotel/ Riad. » Guide in the medina of Fez and Marrakech. » Tips to the driver/ guide.